Leamington (the farm on the River Leam) became a spa town in the early 18th century, then later a 'Royal' town in 1838, courtesy of Queen Victoria. The town is spaciously laid out, with wide tree-lined streets containing many grand buildings and long terraces of white stuccoed houses. These fine buildings recall the prosperity of the Regency and Victorian eras, when Leamington was an elegant spa resort. Although the town no longer has a functional spa, it still remains a popular conference and touring destination. During the 18th century it was claimed that mineral springs in this lovely old town were beneficial for the treatment of various complaints. The high-society fashion for taking the waters reached its zenith during the 19th century, when the sick an infirm flocked to take advantage of the town's rich mineral springs. Many staying in the town's many opulent hotels, such as The Regent Hotel; the largest hotel in England at that time. Although the springs (of saline and iron salts) were first discovered in 1586. The medicinal value of these waters were not exploited until the early 19th-c, when Dr Henry Jephson, a local physician, was responsible for the development of innovative health treatments. These facilities continued to provide physiotherapy and hydrotherapy treatments for thousand of patients annually, right up until they finally closed in the late 1990s. The curative waters can still be sampled from a fountain in the foyer of the Royal Pump Rooms. The Pump Room buildings date from 1814 but were mainly rebuilt in 1925. The well tended gardens opposite the Pump Rooms were laid out in 1834, mainly for the benefit of the patrons of the nearby spa bath houses. They were rededicated to the memory of Dr Jephson in 1846 and are still a popular place of promenade today. His marble statue is located in the centre of the gardens, within a corinthian style memorial. 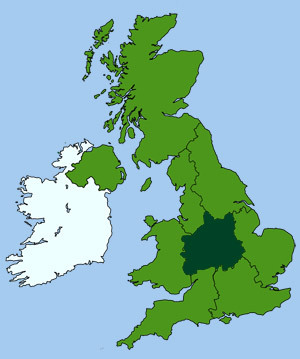 The town's many fine hotels and central location make it an excellent touring centre for the Midlands area. The town centre, based along the Parade, is a smart mixture of shops and Regency buildings, making it one of the finest streets in Warwickshire. Typical Regency, Georgian and Victorian houses can be found in Clarendon Square, Lansdowne Circus, Lansdowne Crescent, Newbold Terrace and Waterloo Place. In particular, Newbold Terrace has a fine row of John Nash style houses, similar to those found around Regent Park in London. Several famous people have lived here, including the American novelist Nathaniel Hawthorne, who resided at No. 10 Lansdowne Crescent and Napoleon III, who lived at No. 4 Clarendon Square. 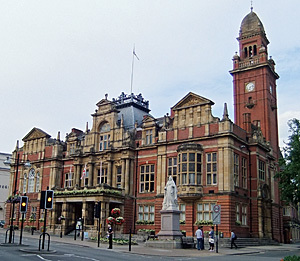 J. Cundall, a local architect, erected the town's large Victorian brick and stone town hall in 1884, which replaced a more modest classical building on the High Street. It has two main venues. The first, a Council Chamber, is still in civic use. The second, The Assembly Hall, is a large performance venue used for a wide variety of community events, meetings and functions. All Saints' parish church in Bath Street (circa 1843), is built in the new Gothic style. One of the largest parish churches in England. The Leamington Art Gallery and Museum, located in the Royal Pump Rooms, exhibits a good selection of artwork. The Royal Pump Rooms were built in 1814 over one of Leamington's seven springs. Originally built as a treatment centre for rheumatic ailments in the 18th & 19th century, it now houses the town's museum and art gallery. The gallery has a collection of modern art and 20th-c paintings, water-colours and drawings, with notable works by Stanley Spencer, L. S. Lowry and Graham Sutherland. The small but interesting museum has a notable collection of pottery and porcelain through the ages and some good examples of 18th-c glass. There is also a display of Victorian costume and other local memorabilia. These beautiful ornamental gardens are named after Dr Jephson (1798-1878), the local practitioner who was largely responsible for the spa's high medical reputation. 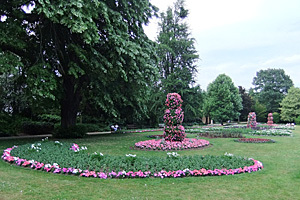 The gardens which have many rare and mature trees, contain a restaurant (previously an aviary), a lake with fountains, and a traditional floral clock. Leamington has a good number of parks and green open spaces. Newbold Comyn, the largest of these, is a 300+ acre park and sport grounds to the east of the town, with recreational facilities, nature trails and an 18 hole golf-course. In fact, it is possible to walk from one side of Leamington to the other through greenery, following the course of the river.